The Sesame Street muppets all wore Sia’s signature black and white wig. Sia guested on today’s episode of Sesame Street (March 25). During the episode she introduced the letter ‘S’ by singing a song about songs. “‘S’ is for songs, and I love songs/Don’t know what I would do without ‘em/I love songs so much/I wanna sing a song about ‘em,” she sang during her cameo. 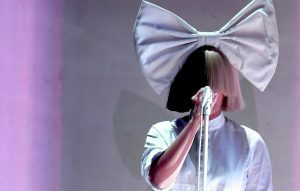 In a rare moment, Sia showed her face during the appearance while wearing her trademark black and white bob wig. The muppets also wore the black and white wigs. You can watch her Sesame Street appearance below. Earlier this month, Sia and P!nk shared their collaborative track ‘Waterfall’. The two artists teamed up with Norwegian songwriting duo Stargate on the track. According to Digital Spy, Sia was the one to make the collaboration happen, with the star bringing P!nk on board for the song, which she also co-wrote with Diplo and Jr Blender. Meanwhile, Sia has called on Kanye West to go fur free during the debut of his new fashion line at his Yeezy Season 5 show. The new Yeezy Season 5 line includes what appear to be several large fur coats and some fur accessories. West’s new clothing featured the phrases “Lost Hills” and “Calabasas”. A projection showed the models on a big screen before they took to the runway. Kanye failed to come out at the end of the show. Taking to Twitter, Sia wrote; “Dear @kanyewest would you consider going fur free? This is the reality of fur for fashion – it’s so sad.” She added a YouTube video called ‘Under the Fur Coats: Rabbits’ Screams of Death’ to the tweet. The post Watch Sia sing ‘S is for Songs’ in ‘Sesame Street’ cameo appeared first on NME.